The article goes on to explain about seven therapeutic outcomes from singing in a group; Communication, Cognition, Engagement, Confidence, Relationships, Empowerment and Exercise and stress reduction. 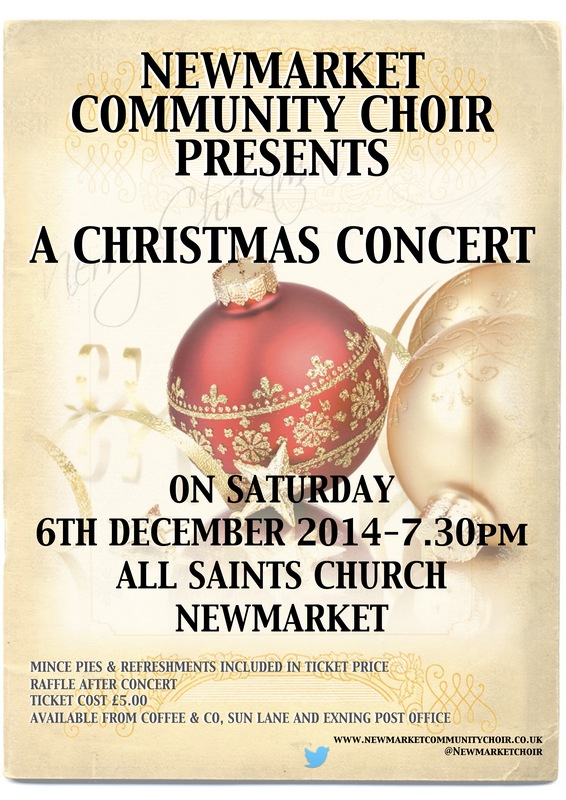 After a wonderful 2014, Newmarket Community Choir would like to wish all of our dedicated supporters a happy New Year! 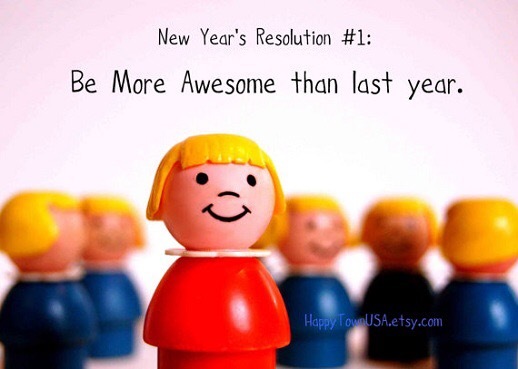 Many of us have New Year’s resolutions (which some keep for longer than others!) and a common theme is often based around joining clubs or groups. 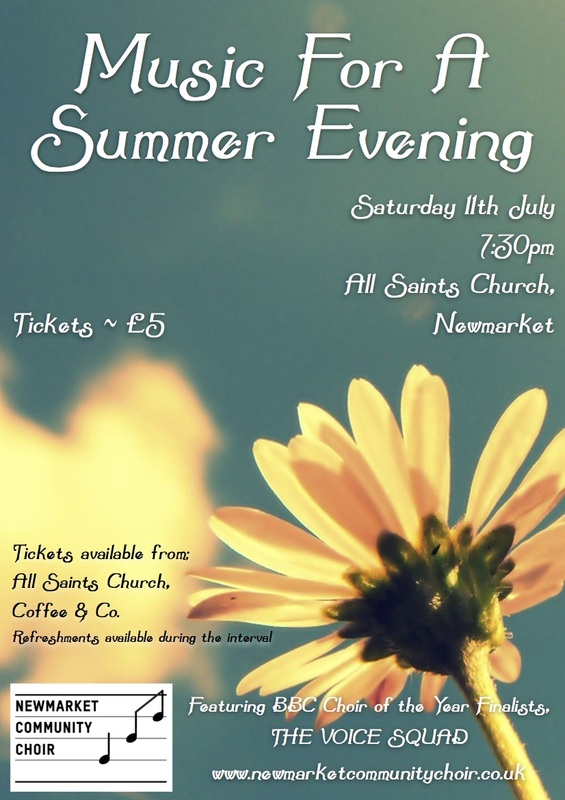 If you are looking for something fun, uplifting and enjoyable, with a strong sense of team work and camaraderie … why not try singing in a choir?! It’s even been scientifically proven that singing actually benefits your health. Sounds too good to be true huh?! Here at NCC, we focus on getting together to make a great sound and have as much fun as possible. We have all been in the situation where we are daunted by having to sing in front of people. Your voice is different to all other instruments because it is such a personal thing. 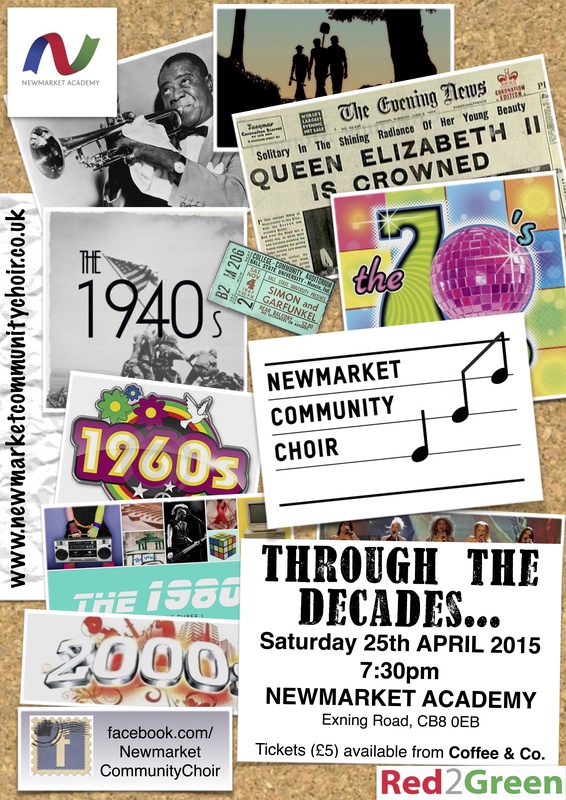 NCC meet every Tuesday, at Palace House in Newmarket; 7pm-8:30pm. Come along and try it for free from the 13th January 2015. This entry was posted in Uncategorized and tagged Christmas Concert. In the four years that the Community Choir has been running, there have been some truly wonderful highlights. 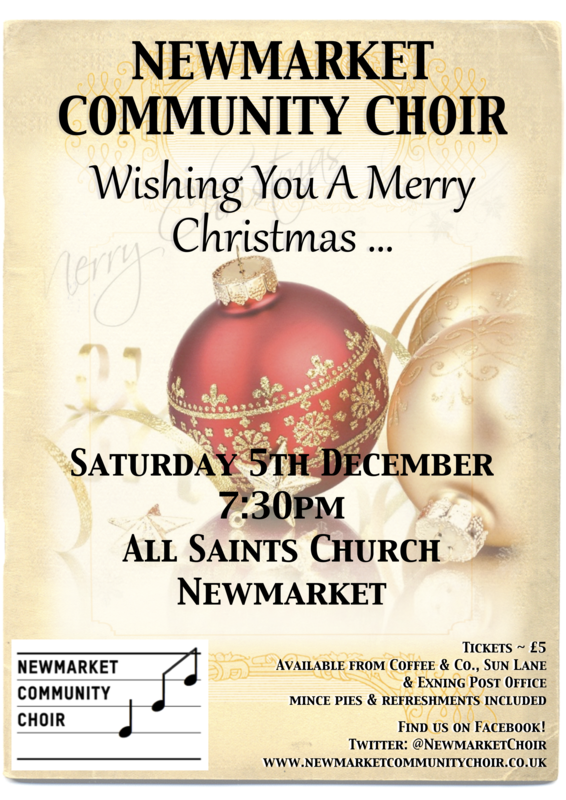 The last few concerts that we have done have been brilliantly supported by the Newmarket community and it makes the choir ‘experience’ even more rewarding when there is a packed out concert venue. Our concert at Christmas and our Rhythm Of Life concert in March raised a total of £2100 for two separate charities. The Christmas concert brought some much needed funds for our chosen charity of the year “Sing For Your Life” and the March concert raised an amazing £1400 for the Healing Hearts Appeal at Addenbrookes Hospital in Cambridge. When we chose “Sing For Your Life” as our charity, it struck a chord with us all in the choir as their mission is to improve the health and wellbeing of people through singing. We set a challenge to try and purchase a Silver Song Music Box for the Newmarket region. The Music Box is simple to use and does not require any formal musical training to operate. It enables people to gain from the many benefits that this group activity allows on a regular (daily) singing basis – a lot more often than is usually possible. It plugs into a television, or it can be operated through a projector & speakers. The bespoke piano accompaniment is designed to replicate singing round the piano in a pub or in the home. Unlike a Karaoke machine, which has a lot going on via the visual & musical backgrounds which can be confusing to many patients, the Music Box has been adapted to provide a simple colour background with only the words being displayed. Crucially, the key and speed can be changed to suit each individual patient group. It is also possible to show images on the screen which has been found to be very useful in the field of reminiscence. 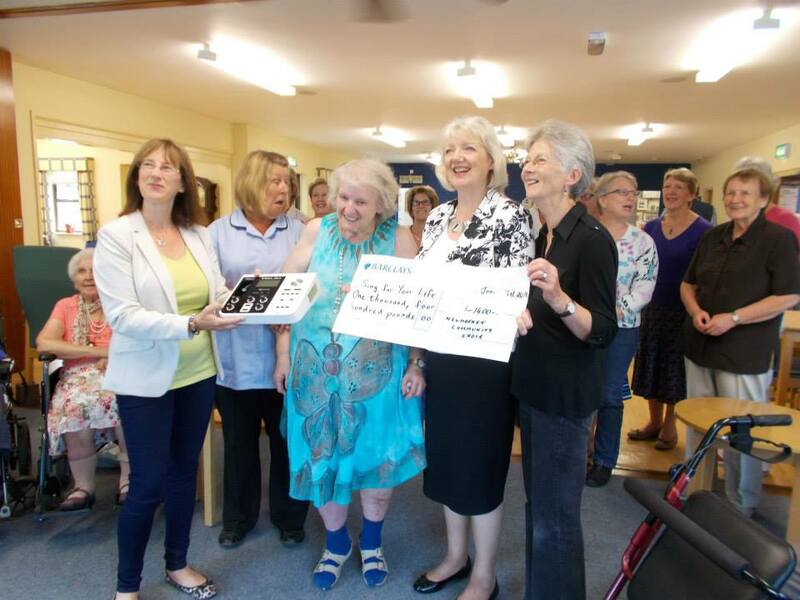 After a generous donation from Forrest Heath District Council, we were delighted to purchase a Silver Song Box for the Newmarket region and some of the community choir members spent an afternoon with the Newmarket Day Centre to officially ‘hand-over’ the box for the Day Centre to look after. Whilst they will be the owners of the box, they will be lending it out to the care homes throughout the region. It was a wonderful achievement for the choir and we are so pleased with the help that we’ve had through all of our fundraising efforts; including our 2013 Charity Christmas single! Thank you all for your continued support and we’ll see you at the next concert! This entry was posted in Charity, Healing Hearts Appeal, Silver Song Music Box, Sing For Your Life.